We have changed countries twice in two days and are now in Hungary. Today’s route along the Donauradweg took us out of range of almost all of our fellow radlers. They were nowhere to be seen. The quality of the path deteriorated into a gravel two wheel track on top of the dike with many car barriers that are designed for bikes to cross, but slow progress quite a lot. Signage was nonexistent so our map and Garmin were essential. The water level in the river is metres higher than the villages nearby. We needed to find breakfast so ventured into the village of Baka. It met almost all criteria of the stereotyped Eastern European small town with roads in poor shape, drab buildings, single shop with limited range of goods. We bought a few things and then went on to neighbouring larger town, Gabcikovo, where the bars and cafes were just opening (9am on Sunday). The bar we stopped at served us coffee, and quickly acquired a crowd of regular customers who got started on beer. These blokes all arrived on bicycles – Ian reckons they all lost their licences. Free WiFi was available (good for a family Skype call). WiFi is fairly easy to find. The long ride along the dike on the bad bike path inspired a singing session. We got through a good selection of songs from the AUAS and NFBM repertoires with a few assorted old faves. Lunch in Komarno, nice city with interesting centre and history (we take the just-in-time approach and look up Wikipedia). 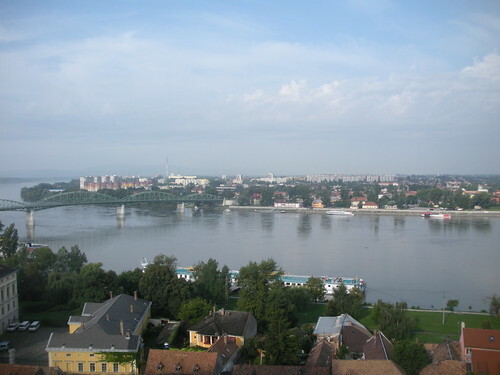 Then across the river and into Hungary. A thunderstorm was brewing and we sheltered in a bus stop with a Hungarian woman while it rained and hailed. Then we stayed on the road all the way to Ezstergom. Interesting sights: piles of watermelons for sale by the roadside (sorry no photo); muddy torrents resulting from rainstorm; more of those manly bars serving beer (we stopped at one and found out that forints, not euros, are the currency here); beautiful city of Ezstergom which we will explore tomorrow. This entry was posted on 15 August 2010 at 7:53 pm and is filed under Slovakia. You can follow any responses to this entry through the RSS 2.0 feed. You can leave a response, or trackback from your own site.